Adoni is a teenaged girl who lives in a downtown apartment with her mother, an emotionally and physically abusive woman who drinks too much. One evening, Adoni finds herself drawn to the enchanting voice of a man singing in the alley beneath her bedroom window. The man, Ritter, brings Adoni to the Welcome, a northern colony of the In-Between world, where young people who have been rescued from harm are kept safe by their sworn immortal protectors, the pipers. But when the Welcome is attacked by changelings—led by the vicious and charismatic Sylvester—and a centuries-old grudge spills over the edge and threatens to destroy the colony and everyone who lives there, Adoni must find the strength and courage within to stop the oncoming war. This stirring coming-of-age novel accurately portrays issues such as domestic violence and emotional abuse, as well as cultural and sexual identity. The Voices in Between snatched my attention with its unusual, atypical heroine: fourteen years-old Adoni could have been drawn out from a bleak social documentary. She is a school failure and outcast. Her “bulging flesh” and her “brown skin and black eyes” doesn’t fit the all-too-common fantasy stereotypes. She was raised – or rather neglected – by a single mum who let herself sink into alcoholism, absolute poverty, and child abuse. On top of that, Adoni drinks, smokes and swears. Nonetheless, I felt sympathy for Adoni right away: I felt like she was stolen the happy childhood that any child deserves. Her pain and misery is so evident behind her facade of rude and offensive behaviour: it felt like her situation determined who she was and it hurts. The first pages of the book moved me, depicting the daily life of a neglected child who is hungry, wary of other student’s mockery, and scared of being hit by her mother. Then, the fantasy takes hold of the story. A mysterious man appears in Adoni’s street at night, sings and lures her neighbour’s 3-years-old into a magical portal. In a whim, hoping to escape her life, Adoni jumps through the gate. She ends up in a meadow surrounded by small cottages and a deep forest covered in thick snow: a perfect Canadian-country winter postcard. She soon learns that she invited herself in “The Welcome” colony, hidden in a world called the “In-Between”, where neglected kids are brought and sheltered till they reach their 18th year. A few adults, called the “Pipers”, take care of the camp. They are not allowed to talk to the residents they brought in but, since Adoni came by her own mean, she gets to know both sides of the community: other children living at The Welcome and the team of Pipers. I loved how The Voices in Between makes you slowly learn to know each character of this small society. They all have their struggles and their secrets. They all show a facade – just like Adoni – depending on the circumstances or the audience. And more importantly, they all have been abandoned, one day, by somebody they trusted and they all try to cope with this. The Voices in Between‘s character developments are particularly appealing, showing that although pain affects us, we can still influence how it changes us by making the right choices. I also really love how the different characters’ lives are intricately interweaved and how you only get to fully understand their actions when you learn about their relationship with each other. Another aspect of the book I really enjoyed was the subtlety of the magic. First, the In-Between’s world is somewhat overlapped with Adoni’s. When Adoni focuses her eyes on a particular place, she can see the silhouette of the same location in her home town, as if sketched on some transparent paper. It succeeds in connecting the two worlds rather than making the In-Between a totally alien dimension. Second, magic is discreet and natural, it’s not in your face or excessively dramatized: for instance, each resident has a magic chest that can provide whatever they wish and it just becomes a habit. Actually, most kids use it to get food and toys. Nothing really over the top. Also, objects branded with the name of the In-Between’s God is magically enhanced. For instance, a pan branded “Ansgar” won’t ever, ever burn food. This magic system leads to some interesting thoughts in the book: does it make you really happy to get whatever you want with no effort? Is it satisfying to craft something using a fail-proof tool? Finally, I found Charlene Challenger’s writing style truly charming. There is already something poetic and enchanting in the In-Between with its snowy landscape and its Christmas air. But the way music is depicted in this world is really what makes The Voices in Between‘s magic so unique. The Pipers have exceptional singing abilities: they absorb sounds, any sounds (including Death’s) and use them to craft songs portraying – almost impersonating – the children they bring in to The Welcome. The music becomes a tangible entity: it takes shape, multiple shapes, moves around, touches characters… It’s simply beautiful and I really, really loved this. However, a few details prevented me from giving the book 5 stars: one of them was the abrupt transitions. Things happen too suddenly in The Voices In Between. An obvious example is Adoni’s love story. It’s so fast, it doesn’t feel natural: you don’t have time to see Adoni fall in love. It just happens. Another one was Adoni’s seemingly inconsistent behaviour. For instance, she would sometimes reason like an adult, then behave like a child; or the inverse. 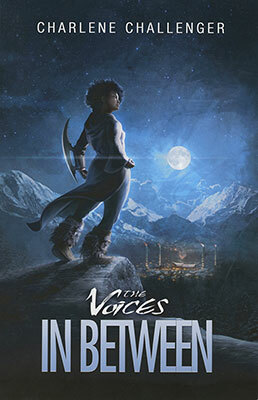 Nonetheless, I sincerely enjoyed The Voices In Between and I highly recommend it. I liked the snowy world, the subtle magic, the special role of music, and the reflection on child abuse and abandonment. I grew fond of every single character. I found the book beautifully written and smart. The In-Between world did fascinate me and I can’t wait to find out more about it in the next book!